Appe is a common breakfast dish in Mangalore. 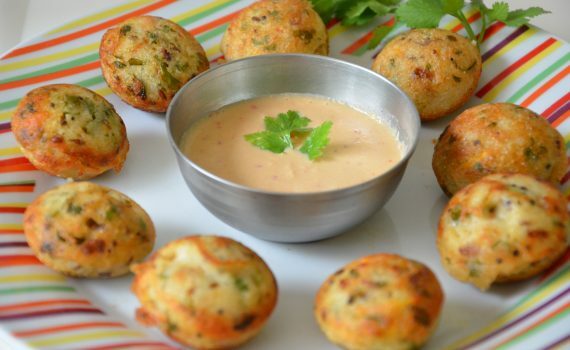 It’s also popular in the other Southern states and is called Paadu/Guliyappa in Karnataka, Paniyaram in Tamil Nadu, Gundponglu in AP and Telengana. And called ‘dosa in a ball’ by my daughter! 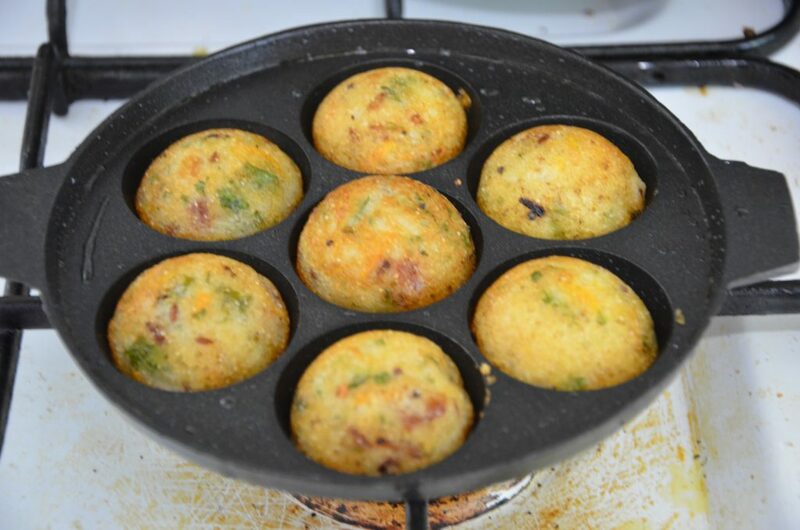 It’s made with the dosa batter in a special ‘appe pan’ which has 5-7 or more round holes. The batter is poured into these holes and the resulting appe is almost round like a ball. Wash the idly rice, raw rice, fenugreek seeds and whole urad dal then soak for 6-8 hours. Grind the soaked mixture with enough water to get a smooth batter. Transfer the ground batter to a clean vessel and cover it and let it ferment in a warm place overnight. Heat oil in a pan and add the curry leaves, onions green chili(optional) . Add this mixture when cool to the batter and mix well. Heat the appe pan till its really hot(test by sprinkling water-it should sizzle). Add a little oil/ butter/ ghee into each mold. Drop the batter to fill the mold. Cover and cook for a minute. Then turn and cook on the other side till its golden in colour. The appe should be crispy and golden on both sides.